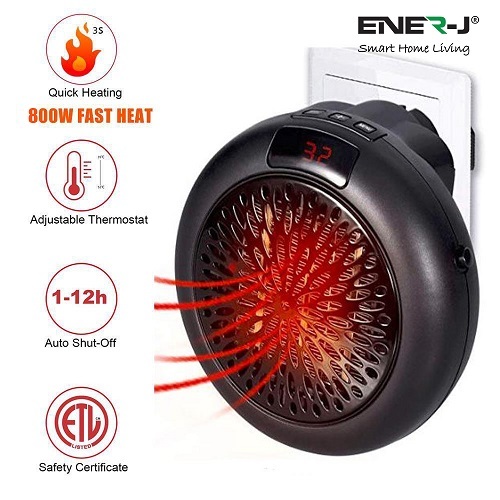 This compact energy efficient new smart living product from Enerj is a revolutionary new way to heat your home. 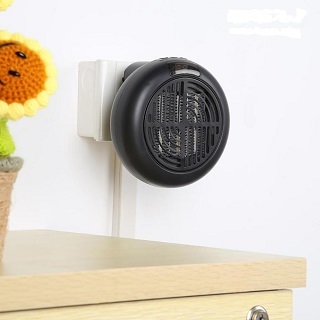 This three pin plug easy heater is chordless and attaches directly to the wall. It takes up minimal space and will only add a maximum of about 12 cent an hour to your energy whilst in use. This rotating plug space heater has an inbuilt digital screen which allows you to adjust the temperature setting. You can also adjust the rotating speed of the fan. When on high speed it operates at 800 Watt and on low speed it operates at only 650 W.
The length of time it will run for is also adjustable of between 1 and 12 hours. It also has an auto shut off facility for when the room reaches the desired temperature. The product comes with a one year guarantee and is ideal for rooms where space is at a premium and you don't want wires running everywhere.